No one needs to tell entrepreneurs that it’s harder to start and grow a business in a place where government regulations make it complicated to obtain licenses and permits, hire employees, or pay taxes. A survey released today reveals which cities and states are toughest on small business and which are most accommodating. A Small Business Friendliness study by Thumbtack, an online platform that connects sellers of services with customers, asked more than 12,000 small business owners about the policies that affect their ability to start, run, and grow businesses in 35 states and 78 cities across the U.S.
Respondents included skilled professionals such as electricians, music teachers, wedding planners, photographers, dog trainers, housekeepers, and landscapers. Sixty percent of respondents are solopreneurs, and 54 percent have been in business for at least 3 years. Compared with American small businesses overall, Thumbtack says the skilled professionals who use its platform are more diverse across race and gender and more likely to own a business at a younger age. 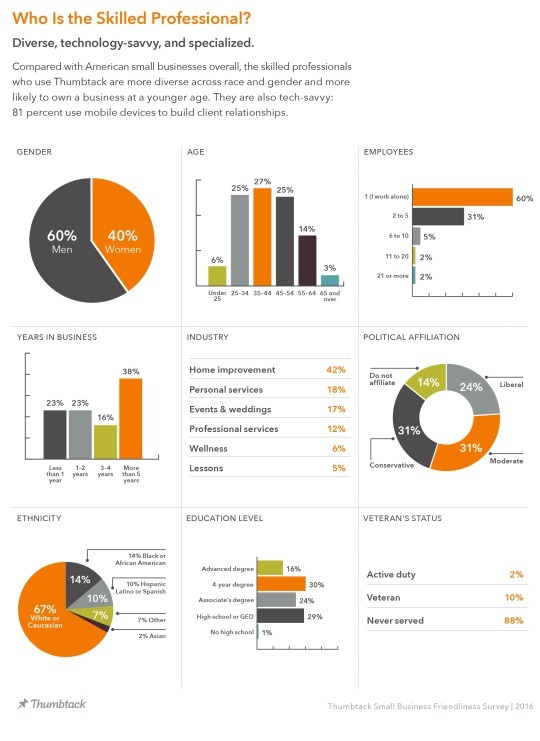 They are also tech savvy: 81 percent use mobile devices to build client relationships. Connecticut business owners won’t be surprised that their state is ranked worst of all for business friendliness or that Bridgeport, Conn., is among the worst 5 cities in the country for business. Illinois, California, New York, and Alabama joined Connecticut in the bottom 5 ranked states, while Syracuse, Oxnard, Calif., San Francisco, and Tucson were the other 4 worst cities. 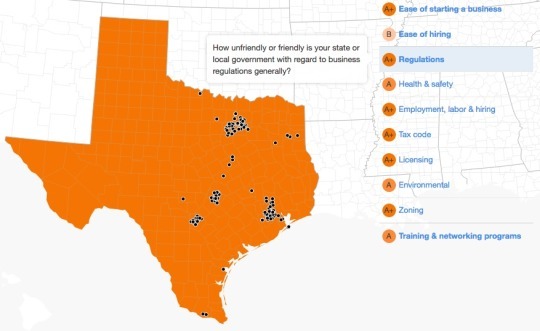 Overall, cities in Texas and Tennessee ranked best for small business, while economic heavyweights in New York and California earned failing grades. The 2016 report also highlights the top policy concerns for skilled professionals, with in-depth case studies of five cities from five different regions that performed across the grade spectrum: Atlanta, Austin, Boston, Minneapolis, and San Francisco. According to Lucas Puente, economist at Thumbtack, which has conducted the annual study since 2012, governments that business owners rated highest make regulations easy to comply with and enforce them consistently. They also invest in training programs and government websites. “These insights provide a roadmap for policy makers to create environments that foster entrepreneurship and innovation-outcomes critical for continued economic growth,” he says.